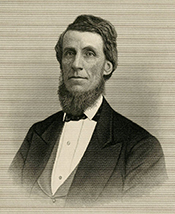 GEDDES, George Washington, a Representative from Ohio; born in Mount Vernon, Knox County, Ohio, July 16, 1824; attended the common schools; studied law; was admitted to the bar in July 1845 and practiced; judge of the court of common pleas of the sixth judicial district in 1856; reelected in 1861; again elected in 1868, and served until 1873; resumed the practice of law; unsuccessful Democratic candidate for judge of the State supreme court in 1872; resumed the practice of law in Mansfield; elected as a Democrat to the Forty-sixth and to the three succeeding Congresses (March 4, 1879-March 3, 1887); chairman, Committee on War Claims (Forty-eighth and Forty-ninth Congresses); declined to be a candidate for reelection in 1886 to the Fiftieth Congress; resumed the practice of his profession; died in Mansfield, Richland County, Ohio, November 9, 1892; interment in Mansfield Cemetery. Papers: In the Charles Baldwin Sedgwick Papers, 1814-1891, 1.75 linear feet. Correspondents include George W. Geddes. An unpublished guide to the papers is available in the repository. Geddes, George Washington. Speech of Hon. George W. Geddes, of Ohio, in the House of Representatives, Tuesday, April 29, 1884. Washington: [Government Printing Office], 1884.